Can you put borders on social media interactions? In January 2013, blogger Elie Fares from Separate State of Mind received a supportive email from an Israeli and wrote about his dilemma of answering him back. “I recently received an email from an Israeli […] and the email was touching. People advised me not to reply. So I didn’t. But I really, really wanted to. Not because I ‘approve’ of the state of Israel. Not because I want to leak out information which I don’t have. Not because I want to feel a rebel in doing so. But because the email really does warrant a reply as decent as the email itself,” he wrote. He ended up publicly answering the email on his blog. Late last month, McDonald’s Lebanon unknowingly invited an Israeli tweep (Jeremie Berrebi) to have a cup of coffee at McCafe. 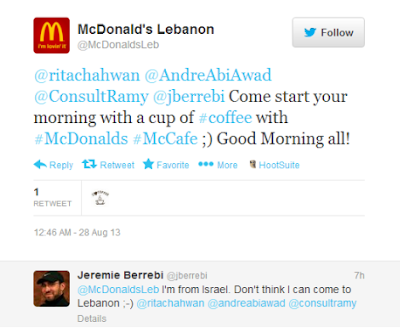 Considering the situation, McDonald’s community manager has probably automated the task of inviting people for coffee when they mention some keywords (possibly morning, tired, sleepy, coffee, etc…) without actually checking who the users are. I do not blame the community manager since he/she is probably underpaid and managing several accounts when the agency is keeping all the profit to itself. At the end, the agency probably got a lot of heat from the client (and will possibly get more due to this article). Yet, for me, even though it is technically a social media fail, it is not the end of the world. Due to the sensitivity of the situation, community managers have to be extra cautious about this issue but everyone makes mistakes. I am not saying that we should be heavily engaging with Lebanon’s “mortal enemy” on social media, but when incidents like this happen, it should not be considered as a great betrayal. On the other hand, community managers should learn from McDonald’s mishap and always take the extra step to see who they are communicating with. 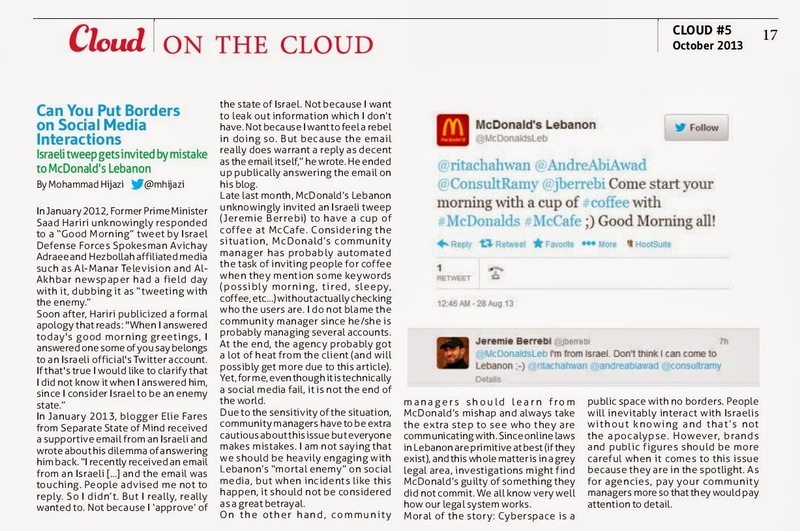 Since online laws in Lebanon are primitive at best (if they exist), and this whole matter is in a grey legal area, investigations might find McDonald’s guilty of something they did not commit. We all know very well how our legal system works. Moral of the story: Cyberspace is a public space with no borders. People will inevitably interact with Israelis without knowing and that’s not the apocalypse. However, brands and public figures should be more careful when it comes to this issue because they are in the spotlight. As for agencies, pay your community managers more so that they would pay attention to detail. This article was publishes in the 5th issue of Cloud961. You can download the issue here.